Anthraquinone derivates, like physcion, emodin, rhamnicoside alaterin, aloe-emodin, frangula-emodin, rhein glycosides, and chrysophanol. Used for: The remedy is applied to induce vomiting, kill helminthes, treat constipations, stimulate the organism, promote bile movement and urination, and treat rheumatism. It is additionally valued for its bitter properties. 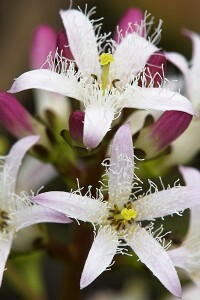 Bogbean’s primary value consists in aiding the treatment of rheumatoid arthritis, osteo-arthritis, and rheumatism. The remedy stimulates bowel muscles, producing a laxative effect on the gastro-intestinal tract. Still, it’s not recommended for rheumatism sufferers who are exposed to diarrhea or intestinal colic. The remedy is a strong stimulant which helps improve bile movement, and treat other conditions associated with weak gallbladder and liver, stimulating their activity. Bogbean is marked in the works of Kloss, particularly “Back to Eden”, as follows: an effective medicine for kidney and liver conditions, dyspepsia, jaundice, recurrent fevers, scurvy, scrofula, rheumatism and stomach catarrh. Used as an anti-helminthic remedy. Induces vomiting when used in large doses. Increases appetite by boosting stomach juice excretion. Preparation and Intake: To make an infusion, take 1-2 teaspoons of herb extract; fill it up with a glass of boiling water, and let stay for 15 minutes. The result should be taken thrice a day. In form of tincture the herb is used in a quantity of 1-4 ml thrice a day. Commonly mixed with: As an aid in rheumatism the remedy is well mixed with Celery Seed and Black Cohosh.